I haven't been blogging as much recently due to my fatigue playing up and visiting family in January but I am back now and keen to get back in the flow of things. I have lots of posts coming up over the next few weeks including a few reviews, my latest competition wins and more. But to start I have a wonderful giveaway for you all. I don't know about you but I love nothing more than having a great girls night in, Watching a good movie, chatting and munching on some chocolate. If you are the same as me then this giveaway will be right up your street. I have been given a wonderful ultimate girls night in bundle to give to one lucky reader. Thank you! I Love a girly night in! Thankyou for this amazing giveaway! :) it would be the perfect treat! Glad to hear you're feeling better & you're back to blogging. Hope you are feeling better - fab comp for the wife! Lovely idea. I'm long overdue to host a girl's night in. Love Bingo! Not played it in ages. Perfect package. This would be fun for a night in. Always wondered what a chocolate pizza was like! Thanks for a super competition. This sounds ideal for when my girlies visit. They've left home,and having a girly night with hubby just isn't working! fab giveaway- love the chocolate pizza! Nice prize, chocolate pizza looks yummy! Super prize, sending you lucky dust too! I really want to try the chocolate pizza! that chocolate pizza looks amazing! Great prize for a wet winter night. It's all you need for a great night in! fabulous prize- thank you so much for offering. Thanks for the competition, sounds like a good evening for the winner! yes, please! I need a break from the kids! Thanks for the giveaway - would love to win this! Fabulous giveaway, would love this. Thanks for running a lovely competition! This would be a lovely treat for a girls night in with my pals!! This is a good idea for a competition, there's nothing better than a night in with the girls. Chocolate pizza has to be the best pizza! 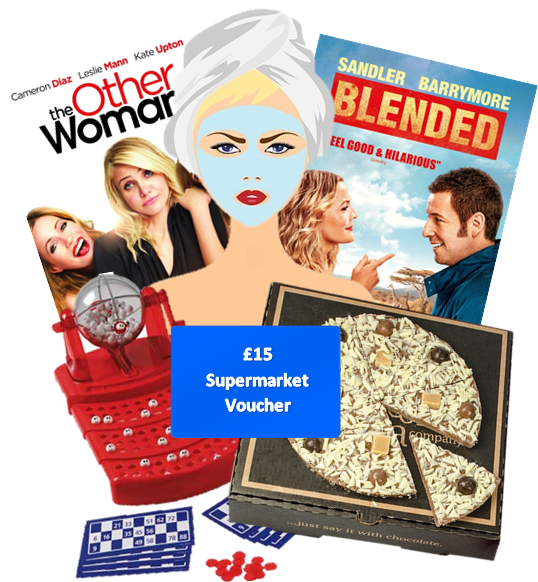 Great giveaway - love a girly night in! Lovely prize, would love to win! I don't get to see my friends as often as I'd like as we're all so busy, so this prize would be a good excuse for a get-together! Thanks for the lovely giveaway, that chocolate pizza looks super yummy. Ultimate girls night in bundle sounds fabulous to me! Lovely giveaway ... I'd love a chocolate pizza!! Fab prize. You know I'm a big fan of yours!! would be great for a girls night in with my sister! great competition - fingers crossed. ooh, id love to have a girls night in with this lot! Thanks for the amazing giveaway! I haven't had a girls' night in for AGES. Chocolate pizza. What a great idea! the chocolate piizza sounds amazing!